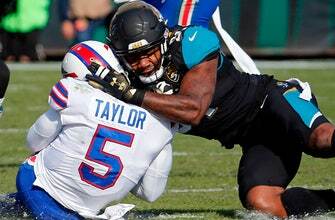 JACKSONVILLE, Fla. (AP) — Jacksonville Jaguars coach Doug Marrone believes defensive ends Dante Fowler and Yannick Ngakoue can coexist in the same locker room, in the same meeting room and even in the same huddle. Marrone provided little insight Tuesday into what prompted the players’ post-practice skirmish two days earlier and declined to divulge why Fowler was suspended and Ngakoue was not. Marrone made it clear, though, that he expects both guys to be able to work together moving forward. The Jaguars declined to pick up the fifth-year option in Fowler’s contract, likely making this his last season in Jacksonville. Marrone suspended Fowler and All-Pro cornerback Jalen Ramsey for a week for violating team rules and conduct unbecoming a Jaguars football player. Neither one is traveling to Minnesota for two days of joint practices with the Vikings and a preseason game. The teams play Saturday. Fowler was involved in several fights Sunday, including one after practice with Ngakoue in which they had to be separated repeatedly. No punches were thrown. Ramsey was one of several teammates in the middle of it. He shouted profanities at media members who captured the altercation on video and later took to Twitter to threaten reporters with “war” for releasing the video. The suspension is the latest setback for Fowler, whose checkered past includes two arrests. Fowler was arrested last year for hitting a 55-year-old man, knocking off and stepping on his glasses, and then taking the man’s grocery bag and tossing it in a lake. Fowler pleaded no contest to misdemeanor charges of battery, criminal mischief and petty theft. The case was closed in March, with Fowler sentenced to a year of probation and 75 hours of community service. The NFL suspended him without pay for the season opener, a one-game penalty that will cost him $214,000. Fowler also was arrested in Miami Beach in 2016 and charged with misdemeanor counts of assault against a police officer and resisting arrest without violence. The charges were later dropped. Fowler, the third overall pick in the 2015 draft, is in the final year of his rookie contract and due to make $3.64 million. He has 14 sacks the last two seasons, including two in the AFC championship game. “I think when he comes back Monday, it’s a good question, you know what I’m saying, that you might ask him,” Marrone said.